On February 8th, 1934, local farmers met and elected Fred Harding to act as a chairman of their meeting. Fred explained that “the purpose of this meeting is to discuss the possibility of starting a Farmers Union Oil station.” Ernie Cloud moved that a Board of Directors be elected to incorporate until a stockholders meetings could be held. Board members were then elected and then met to elect their president, vice-president, secretary, and treasurer. On February 13th, 1934, The Board of Directors agreed to begin selling stock at $10 per share and to capitalize it at $10,000. On March 5th, the license was granted and the Board was authorized to sell stock under the direction of Board President Fred Harding. 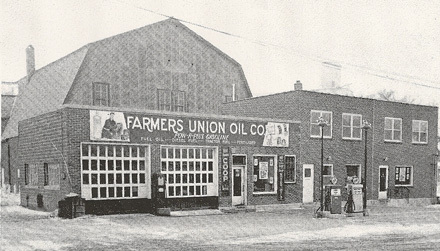 In September of 1934, the Board discussed changing the name of the corporation from Farmers Union Oil Company to Minnesota Farmers Union Oil Company. On November 26th, the Board unanimously voted to keep the name Farmers Union Oil Company. Fred Harding, A.G. Canton, and C.W. Olson were elected on February 23, 1935 as a committee to begin searching for a site. On March 8, 1935 the company purchased the Ludke Bulk Oil Station for $1,750. It included 3 bulk oil tanks with complete equipment and a street storage house with a $10 transfer of Right Away until November 1, 1935. Two 500-gallon tanks and a pump house were to be ordered. The first stockholder meeting was help on March 25, 1935. The very next day, M.P. Hendrickson moved that “we hire an experienced man with money,” as manager. A lease was signed for the service station lot in April 1936. In May of that year, A.G. Canton was hired as manager. 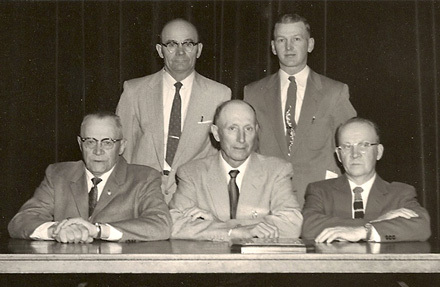 The first regular monthly meeting of the Board of Directors of the Farmers Union Oil Company was held June 4, 1935. The Board has met on a regular basis since then, and although the names and faces of the Board have changed, the concern for success remains the same.